Mother Nature is unleashing her despised cousin — Jack Frost — as below-zero temperatures are forecast for a good portion of the United States. Though most U.S. farm animals are raised in environmentally controlled barns, there are some that do not have the luxury of comfortable dwellings. Some farms are also diversified with other livestock such as cattle, and what good farm doesn’t have a loyal man’s best friend? Animal care is a top priority, regardless the weather, and the Wisconsin Department of Agriculture, Trade and Consumer Protection is one of the many agencies warning pet and livestock owners to protect their animals during extreme cold. Food: Outdoor animals will need more food than usual and at good quality to produce body heat. 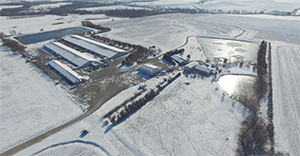 As a general rule, nutrition requirements increase about 1% for every degree the temperature falls below 20 F. For horses, nutritional needs increase at temperatures below 45 F.
Shelter: For large animals, provide a dry place to get out of the wind, such as a windbreak or three-sided shelter. Smaller animals will need an enclosed space to better retain body heat. Make sure other buildings do not deflect wind or snow into the shelter. 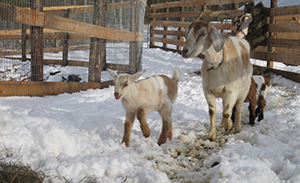 Keep animals dry and provide bedding to help insulate them from frostbite. Water: Provide access to fresh water daily — frozen streams or snow require an animal to use body heat to melt it. Stock tank heaters and frost-proof waterers can help protect water from freezing. If you do not have a heated bowl, fill the bowl with lukewarm water at least twice a day. DATCP’s Division of Animal Health monitors animal health and disease threats, promotes humane treatment of animals and provides licensing and registration regulation for animals in Wisconsin. For more information about caring for animals in extreme weather visit DATCP’s website.